Axon Optics Therapeutic Glasses For Migraine Products includes Axon Optics Jura, Maddi, Airplex, Vescent Migraine Glasses, Axon Optics Dalliance, Axon Optics Flex Curve, Hannik, Wrap 7C and more. Light sensitivity is one of the most common symptoms of a migraine. People who suffer from migraines tend to have more light sensitivity also known as photophobia or photosensitivity than the general population. For many chronic sufferers (about 80%) who have photophobia actually trigger a migraine attack. Axon Optics Migraine Glasses, Contact Lenses and Sunglasses provide relief to people who suffer from photosensitive migraines. Axon Optics is a high-tech startup that provides eyewear that is intended to help people who suffer from photosensitive migraines. Based on the latest research from the University of Utah’s Moran Eye Center, they created precision tint lenses that are proven to block the light implicated in aggravating migraine and light sensitivity. Their first line of FL-41 tinted glasses products was launched in June 2011. Their efforts for bettering the lenses and frames have been ongoing. In Axon Optics Clinical Trial, FL-41 tinted glasses have been proven to decrease light sensitivity and reduce both the frequency and severity of a migraine. Currently, research is conducted at the University of Utah and other clinics to develop more improved eyewear for light-sensitive conditions. All Axon Optics lenses are a simple, non-invasive, non-chemical and natural solution for a migraine with no side effects related to medication. In addition, they provide 100% protection against UVA and UVB rays. Axon Optics Therapeutic Lenses come with premium anti-glare coatings that prevent reflection, scratching, smudging and debris. High-Quality – There are companies in the market that sell glasses with precision tinted lenses, but may not have the level of quality like Axon Optics Therapeutic Glasses. Axon understands that migraine glasses must feature quality, effectiveness, spectral characteristics, and optical densities of tints. Hence, they have developed a proprietary lens used by thousands of people. Frame Options – They carry a wide collection of frames to fit in each individual’s preference. People with more severe light sensitivity may prefer a wrap style frame or people with less light sensitivity can choose a more traditional frame. Fit over frames is Axon Optics’s most popular products, which can be worn over existing prescription eyewear. Axon can also accommodate prescription or custom lenses. Ongoing Research – In conjunction with eye clinics and neurological clinics, Axon is constantly involved in researchers to develop new products and help people with a migraine and other light-sensitive conditions. SpectraShield FL-41 lenses – Only a few key wavelengths of light causes discomfort to eyes. These wavelengths are identified and can be countered with Axon Optics SpectraShield FL-41 lenses. These unique, high-tech lenses are only available from this company. Multiple lens types – Axon Optics currently offers five lenses types – Indoor, Outdoor, Transitions, Extra-Dark Polarized, and 365-day Soft Contact Lenses. All Day, Daily Use – Wear Axon Optics eyewear at any time, even before you encounter uncomfortable light to protect against migraines before they begin. No Side Effects – Axon Optics lenses are a simple and natural solution to get relief from migraines and light sensitivity. They are non- invasive, contain no chemicals and eliminate side effects from migraine medication. Money Back Guarantee – All non-prescription Axon Optics eyewear comes with a 30-day, money-back guarantee. 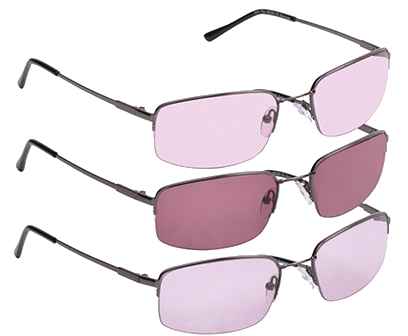 Axon Optic SpectraShield proprietary FL-41 tinted lenses is a specially designed rose-colored lens. The FL-41 Lenses are created to provide natural relief to people suffering from migraine headaches and general light sensitivity. SpectraShield FL-41 lens – Developed by Axon Optics, this proprietary advanced technology blocks the light that may trigger pain while letting other light in. Natural Migraine Treatment – Generally, people take preventative medications to treat their migraines, but this may result in rebound headaches. Axon’s FL-41 glasses are one of the most effective natural remedies without side effects that work for people with light sensitivity. Tinted Lenses for Multiple Applications – These are helpful for bright lights, fluorescent lights, and sunlight. Daily Use – Use it all day long or at the onset of light discomfort, or during a migraine attack. It is a natural, drug-free way to help prevent migraine headaches! FL-41 is proven to help with conditions associated with light sensitivity. Axon Optics is the original retailer of therapeutic FL-41 tinted lenses online. Their proprietary SpectraShield FL-41 tint appears distinctly different than the regular version. Axon Optics FL-41 effectively blocks the light spectrum that bothers light-sensitive people and causes cumulative eye damage over a period of time. They also offer some variant lenses to fulfill an individual’s needs. Their outdoor tint glasses come with the greatest filtration power. They are the exclusive manufacturer of FL-41 tinted transitions and 365-day Soft Contact Lenses. All their lenses block UVA and UVB light. For complete protection against reflected UV light, add Premium Multipurpose Coating. Users are amazed to notice the difference made by FL-41 Tinted Lenses Glasses for migraine relief. They say it is very helpful and well made. One customer bought an indoor tint and was impressed to see herself comfortable with fluorescent light or bright sunlight. Another customer’s eyes hurt badly within few minutes in fluorescent light or from the outdoor glares, until she found this to protect her eyes. One more customer is using it for a year and is highly satisfied to see how effective and comfortable they are for light-sensitive people. Overall, each customer thanks to the company to produce something that can correct photophobia. Axon Optics Therapeutic Glasses For Natural Migraine Relief is developed to help people with migraine headaches, light sensitivity (photophobia), or other light sensitive conditions. These special glasses with precision tinted lenses often referred to as “migraine glasses” reduces the amount of painful light entering the eye. Clinical studies show that by blocking this light, many sufferers have experienced reduced frequency and severity of migraine attacks. These glasses are available with or without an eyeglass prescription. They have utilized the latest research associated with a migraine and photophobia to develop the SpectraShield FL-41 Axon Optics Migraine Glasses lens. These lenses minimize the exposure to certain types of artificial light, mainly blue light and green light, which may exacerbate light sensitivity in people with migraines. Both indoor migraine glasses and outdoor migraine sunglasses are available. Natasha bought two pairs of Axon Optics Migraine glasses – Aerolight frame with outdoor tint and the dalliance frame with indoor tint. She was constantly in pain and was using migraine medication to relieve migraines that occurred almost four days a week. These pairs are true blessings and headaches are now reduced to half. Shirlena already had three pairs of light sensitivity glasses from other company until she bought Wrap7C Indoor. The old glasses had a lot of light coming in from sides, top, and bottom. Hence, she bought this lightweight and comfortable prescription and transition wrap style lenses and enjoy outdoors. Carin bought Skye Flex frames which are stylish, flexible and lightweight. He says these glasses work great to diffuse the light indoors as well as outdoors. He feels less strain on eyes and has fewer headaches since wearing these. Axon Optics 365-Day Soft Contact Lens for Migraine & Light Sensitivity are custom made and last about one year before requiring replacement. A contact lens prescription is must to make the lenses fit the topography of your eye. These therapeutic lenses are 14 mm in diameter as against human cornea which on an average is of 11 mm in diameter. These high-quality soft contact lenses are FDA-cleared. Two versions of this soft contact lens are available – For Brown Eyes, buy a fully-tinted lens that covers both the iris and pupil with about 11.5 millimeters wide tint area. And for lighter eye colors (Blue, Hazel, Green, or Grey), buy light eyes pupil-only tint that is 5 millimeters wide. Axon Optics Returns Policy – Glasses in new condition can be returned within 30 days of receipt for a full refund, less shipping costs. Custom made products such as prescription glasses, lenses in your own frame, and contact lenses are non-refundable. Please note Clearance items cannot be returned. Axon Optics Warranty – All frames and lenses come with a one-year warranty. Axon Optics Contacts – Email at support@axonoptics.com or Call at 779-379-AXON or Live chat on their official website axonoptics.com. Axon Optic therapeutic glasses provide a natural solution for headaches, migraine, and light sensitivity. They offer a wide selection of frames and each set come with a case and cleaning cloth. Although Axon Eyewear is not a cure for light sensitivity or a migraine, the majority of users have found it to be extremely helpful and enable them to perform better at school, home or work. Buy Axon Optics Therapeutic Eyewear Online from axonoptics.com today and relieve a migraine or light sensitivity issues naturally.